For six weeks, 40 volunteers from across the country met in a special online forum to talk about their deepest beliefs. Along the way, their respectful curiosity wound up defying the old warning about never discussing religion with strangers. The volunteers ranged from atheists to evangelicals, Methodists to Muslims, young students to aging scholars. As their e-mails crisscrossed the continent, the forum members moved from exploring their own spiritual yearnings to talking honestly about their anxieties over religious conflict in the world. “As the e-mails started coming from all these different participants, it was so exciting to see all the different viewpoints. I had never been involved in anything like this forum and I really appreciated it,” said Gail Katz, a vice president of the Jewish Community Relations Council of Metropolitan Detroit. Katz now plans to extend a similar opportunity to local women. Last year, she cofounded a group called Women’s Interfaith Solutions for Dialogue and Outreach in Metro Detroit, better known as WISDOM. The cofounders were Christian, Muslim and Jewish women who share her desire for friendship across religious boundaries. 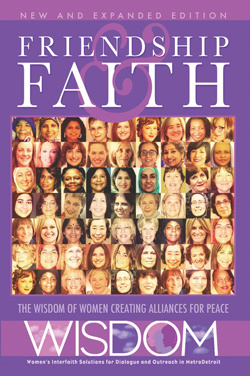 On July 8 in Farmington, WISDOM is hosting an informational meeting for women who want to join international e-mail networks of women promoting peace (details in box above). “My Jewish faith is very important to me, but what gives me the most spiritual energy these days is connecting people across religious and cultural boundaries,” Katz said. That’s the universal motive that drew the 40 volunteers to the national forum that wrapped up this week. The forum on religion was part of an online project to investigate the future of crowdsourcing, a movement in business and media that encourages crowds of volunteers to work on projects such as developing software in online groups. The six-week forum was intended to find out how much farther the crowdsourcing idea might extend into other areas of business and culture. The online forum was cosponsored by Wired magazine editors and the staff of New York University’s School of Journalism, who invited me as Free Press religion writer to oversee the e-mailed conversation on faith. Dozens of volunteers joined the forum from invitations through Wired and other online sources. In addition, a handful of Michiganders were invited to take part. One of the Michigan voices belongs to David Myers, an author and professor of psychology at Hope College in Holland. Myers participates in several nationwide efforts to break down religious barriers, including new efforts to open dialogue between evangelicals and atheists. In the forum over the past six weeks, Myers offered some wise advice for grassroots activism: Keep it simple, so more people can participate. Myers has a severe hearing loss and is an activist in encouraging churches to upgrade their audio systems. His strategy is innovative, because he doesn’t ask congregations to buy the most expensive systems. Activists will see more widespread change, he argues, if they recommend cheaper, more durable systems. In the end, Katz said, if there’s any hope for reducing religious conflict, it lies in these kinds of grassroots spiritual networks in which people share their best insights. “Now, we’ve just got to convince more people to expand their connections,” Katz said.